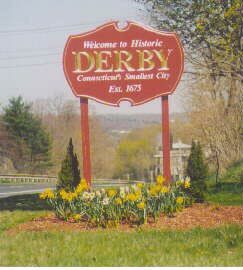 The City of Derby, the smallest city in the state of Connecticut, covers 5.3 sq. miles and has 12,080 residents. It is located in southwest Connecticut at the confluence of the Housatonic and Naugatuck Rivers. The area was inhabited by several Native American tribes including the Paugassetts and the Pootatucks for centuries. A trading post was established at Derby Docks in 1642 by John Wakeman of New Haven, but fur traders from New Haven had been in the area previously. The first year-round houses were built around 1651, at which time the New Haven Colony recognized it as a town, but the residents of nearby Milford protested so vehemently that the order was rescinded and the settlement returned to Milford jurisdiction until 1675 when the former plantation of Paugassett was admitted as the township of Derby by the state legislature. For some time parts of the present day city of Derby were also known as Smithville and then Birmingham. The area prospered through agriculture, a successful foreign maritime trade, and finally manufacturing. The city of Derby was chartered by the state in 1893. The town's successful commercial development was by then based on manufacturing. From the first water-powered gristmill in 1681 to the opening of the Ousatonic Dam in 1870, efficient use of available power attracted a series of large manufactures to the town. While the rivers provided power and transportation that made Derby's location the envy of its neighbors from the earliest times, its geographic location continues to be a favorable asset to this day. Currently located in the center of a triangle bordered by New Haven on the east, Bridgeport to the south and Waterbury to the north, Derby is the hub of one of the largest metropolitan areas in the state, yet maintains its suburban charm. Route 8 provides a vital north-south link to major interstate highways 84 and 95. New York is little more than an hour's drive and Boston is about 2 hours away. Derby is an ideal place to live and work, and we invite you to learn more about the community by visiting our pages.